Regardless of our righteousness or our sin we are reliant on God. Can you relate with either party in this parable? Have you ever recognized your sin and prayed that prayer of the tax collector: “Have mercy on me, Lord, a sinner”? Have you ever felt good about yourself in comparison to another? I am sure that there are times in my life when I can relate to both. But I will admit to you a time in recent memory when I acted as the Pharisee. It was a quick thought, unconsciousness, which raced in my mind, suddenly seemingly out of no where. You may know that I am taking an EMT class right now in Harrisonburg. Because of its location there are a great many JMU students in the class. Everyone started talking about their Halloween plans. “What are you doing for Halloween?” I answered “Celebrating a wedding of course…and then I hope to have candy for some trick-or-treaters.” Some of the college students answered differently: “We are trying to get a taxi ride to this awesome party where are gonna get drunk!” The thought in my mind flashed by: “Thank you Lord that I am not like these college kids whose only fun is found in drinking. I enjoy more wholesome fun like frisbee golf, board games, and the movies.” I was the Pharisee here. The meaning of this parable may seem obvious at first glance, like a parent to siblings “Mind your own business.” Or perhaps it is a simple exhortation to be humble. But there are a few things that make this parable a bit difficult to fit into such easy interpretations. For one thing, the Pharisee is absolutely right – he is righteous and the tax collector is a sinner. I know that we as modern hearers of this parable we are hard-wired to equate Pharisee with “pretentious, holier-than-thou, hypocrites!” But the fact of the matter is he was an expert in the law. And those religious practices he cites are indeed very good things: fasting and tithing – wonderful spiritual disciplines. The tax collector was really a sinner; given over to greed by charging citizens a premium for his services; a political traitor serving the Roman occupation. But, do you hear the difference in the two men’s prayers? The tax collector directed toward God, and dependent upon his mercy: Lord have mercy on me! The other prayer centered on the Pharisee himself. I am not…I fast…I give… In fact the text says the Pharisee “prayed about himself.” He might as well be praying to himself, the Bible says. It is in this boundary building: sinner-righteous, clean-unclean, rich-poor, male-female, Jew-Gentile, slave-free, Pharisee-Tax Collector, us-them where the danger of this pharisee lies. Often it seems whenever we do draw these boundary lines between people that we often find God on the other side of that line. In our Gospel reading the Pharisee drew a boundary, but the tax collector went home justified. This parable is more than a simple exhortation to be humble. Humility, that most elusive virtue. If ever you think you have it, you most likely do not. We certainly miss the point of this parable if we go home and pray to God “Thank you God that we are not as proud as the Pharisee!” If we compare ourselves to the Pharisee, then we are no better than him. The Pharisee prayed about himself, relying on his own righteousness; the tax collector relying solely on the grace of God. I’ve had the unfortunate opportunity of going down a repelling tower a few times. 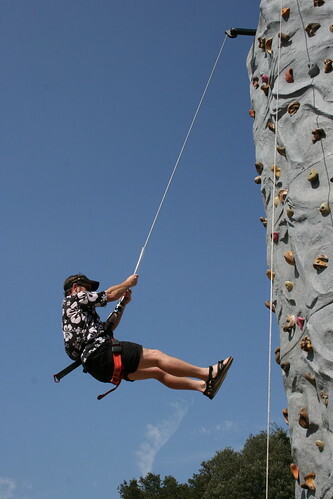 Repelling is where you go up a tall tower, normally by the steps or climbing and then you go down – by a rope, backwards! I hate heights. Now, a repeller has control over how fast he or she goes down the rope. But there is a second rope controlled by someone on the ground. Their job is to stop the rope if the repeller falls. On one unfortunate repelling occasion, I don’t remember the exact context, one individual was quite afraid of the whole thing. He was at the point of no return, with his feet over the edge and he had taken his first step. Then his legs shook uncontrollably, his knees buckled and he fell upright. He clenched the rope and brought himself to a stop. He hung there like a broken yo-yo, hanging on for dear life. The instructor tried to coach him to regain his footing but it was to no avail. A few minutes went by, words of encouragement came from above and below. But he just hung there, gripping the rope. Finally the instructor decided the best thing would be for the repeller to come down and try again – but there was only one way down. The instructor told him to just let go, we’ve got you, you won’t fall. “No way!” he said, and hung there. Nothing we could say could convince him. The broken yo-yo of a man hung there for what seemed like hours. Sweat streamed down his face and his arms began to shake, not from fear but from fatigue. Then the inevitable – his arms just simply could hold on no more under his own power. He lost his grip and…nothing happened. He didn’t fall. The ground rope held him in place, and we was gently lowered to the ground. Regardless of our righteousness or our sin we are solely reliant on God.